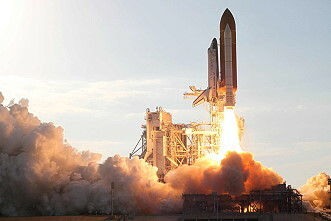 The launch of space shuttle Discovery had to be scrubbed for several times. Target launch date was November 01, 2010. On November 02, 2010, while readying Discovery for launch, engineers reported an electrical issue on the backup Main Engine Controller (MEC) mounted on Engine No. 3 (SSME-3). On November 05, 2010 Discovery's launch attempt, a hydrogen leak was detected at the Ground Umbilical Carrier Plate (GUCP) during the fueling process. Additional inspection of the tank then revealed cracks in foam insulation in the flange between the intertank and liquid Oxygen tank. The insulation was cut away for additional inspection revealing two additional 9-inch (23 centimeters) metal cracks on either side of an underlying structural rib called "stringer S-7-2". NASA managers then decided to cut away additional foam and observed two more cracks on a stringer known as S-6-2 adjacent to the two original cracks. They were found on the far left of removed foam on the flange area between the intertank and the liquid Oxygen tank. However these cracks appeared to had suffered less stress than the originally found. Scanning of the stringers on the Liquid Oxygen/Intertank flange was completed on November 23, 2010. Fueling process on December 17, 2010 saw no problems. But for final tests, NASA directors decided a complete Rollback. The new launch date was set for not earlier than February 03, 2011. On January 06, 2011, NASA managers decided to give engineers additional time to assess external tank cracks and repair scenarios. 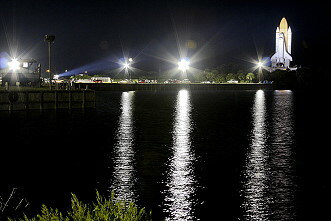 The launch was delayed for not earlier than February 24, 2011. On January 15, 2011 Timothy Kopra was injured in a bicycle accident. He was replaced by Stephen Bowen on January 19, 2011. 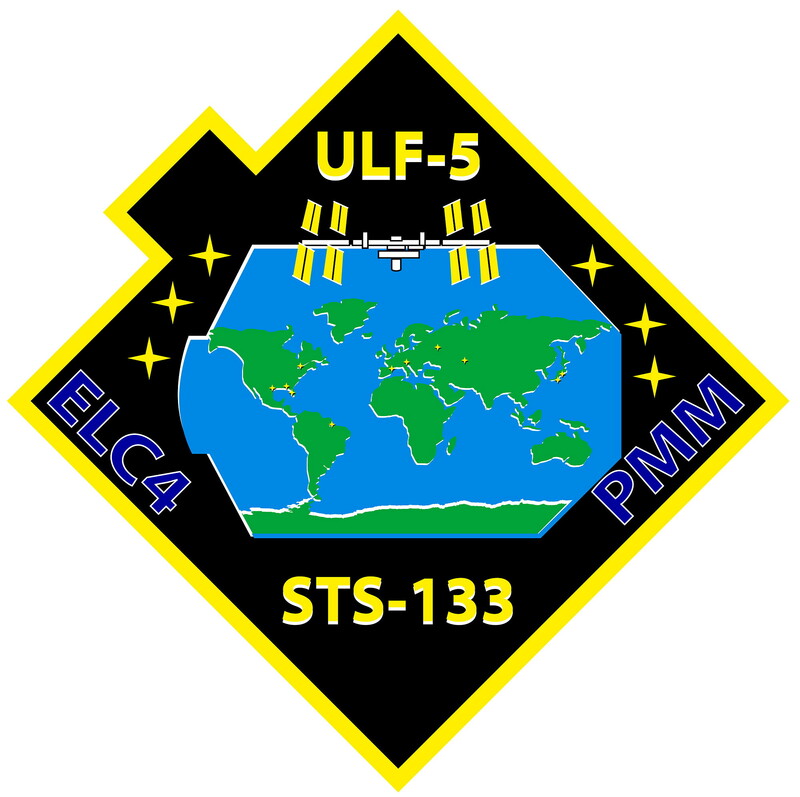 The mission STS-133 (ISS-ULF-5 / ELC-4) transported several items to the space station, including the Permanent Multipurpose Module Leonardo, which was left permanently docked to one of the station's ports. 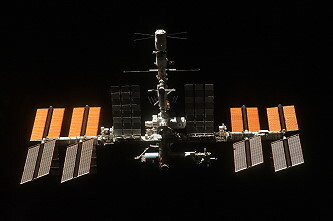 The shuttle also carried the third of four ExPRESS Logistics Carriers to the ISS, as well as a humanoid robot called Robonaut. The Permanent Multipurpose Module (PMM) is a large, reusable pressurized element, carried in the space shuttle's cargo bay, originally used to ferry cargo back and forth to the station. For STS-133, the PMM, known as Leonardo, was modified to become a permanent module attached to the International Space Station. Once in orbit, the PMM will offer 2,472 additional cubic feet (70 cubic meters) of pressurized volume for storage and for scientific use. The module is carried in the cargo bay of Discovery and will be connected to the Unity node on the station. Enhance the module shielding with an improved micrometeoroid debris protective shield design to satisfy the new penetration requirements. Provide the in-orbit maintenance capability by changing the internal harness routing and brackets layout to allow the crew accessibility to the internal equipment. Provide easy interfaces for future exploitation of the retained resources. Provide a certified life extension for all equipments and subsystems. Develope a software update to eliminate faulty alarms. The Italian Space Agency contracted with Thales Alenia Space, which also designed and built the three multi-purpose logistic modules, to make the modifications. This module flew seven times as Leonardo, the multipurpose logistics module. As the PMM module, this will be its final flight and the last pressurized element to be added to the U.S. operating segment (USOS) of the station. On the STS-133 mission, the PMM will carry 14 racks to the station - one experiment rack, six resupply stowage platforms (RSPs), five resupply stowage racks ( and two integrated stowage platforms (ISPs). The Express Logistics Carrier (ELC) is a platform designed to support external payloads mounted to the International Space Station starboard and port trusses with either deep space or Earth-ward views. Each pallet spans the entire width of the shuttle's payload bay, can carry science experiments and serves as a parking place for spare hardware that can be replaced robotically once in space. For STS-133, Discovery will carry the ELC-4 to the station to be positioned on the starboard 3 (S3) truss lower inboard passive attachment system (PAS). ELC-1 and ELC-2 were placed on the station's truss structure during STS-129. ELC-1 is mounted on the port 3 (P3) truss element unpressurized cargo carrier attachment system (UCCAS) while ELC-2 is placed on the S3 truss upper outboard PAS. The weight of ELC-4 is approximately 8,161 pounds (3,702 kg). Remmele Engineering, based in Minneapolis, built the integral aluminum ELC decks for NASA. Engineers from NASA Goddard Space Flight Center's carriers development office developed the lightweight ELC design, which incorporates elements of both the express pallet and the unpressurized logistics carrier. Orbital Science Corporation built the ELC. The ELC is designed to be carried in the space shuttle cargo bay to the station, fully integrated with cargo. Four ELCs will be attached to the station before the scheduled retirement of the space shuttle. Two ELCs will be attached to the S3 and two ELCs will be mated to the P3. By attaching at the S3/P3 sites, a variety of views such as deep space or Earthward directions with a combination of forward or aft pointing allows for many possible viewing opportunities. Cargo stationed on the ELC will be exposed to the microgravity and vacuum environments of space for extended periods of time while docked to the station, unshielded from incident radiation and orbital debris. 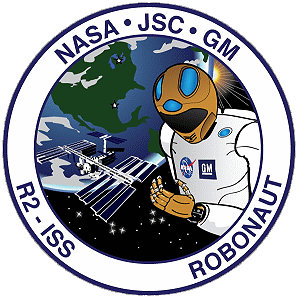 Robonaut 2, the latest generation of the Robonaut astronaut helpers, is set to launch to the space station aboard space shuttle Discovery on the STS-133 mission. It will be the first humanoid robot in space, and although its primary job for now is teaching engineers how dexterous robots behave in space, the hope is that through upgrades and advancements, it could one day venture outside the station to help spacewalkers make repairs or additions to the station or perform scientific work. R2, as the robot is called, will launch inside the Leonardo Permanent Multipurpose Module, which will be packed with supplies and equipment for the station and then installed permanently on the Unity node. Once R2 is unpacked - likely several months after it arrives - it will initially be operated inside the Destiny laboratory for operational testing, but over time, both its territory and its applications could expand. There are no plans to return R2 to Earth. 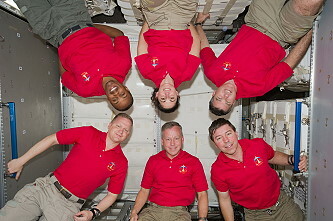 The crew joined the long-duration six person crew of Expedition 26, who were already aboard the space station. 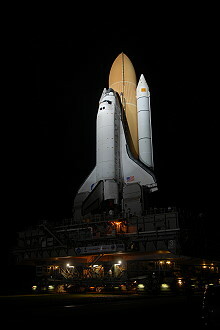 Space Shuttle Discovery also carried the Developmental Test Objective (DTO) 701B payload using Advanced Scientific Concepts, Inc.'s DragonEye 3D Flash light intensification detection and ranging (LIDAR) sensor. The addition of the pulsed laser navigation sensor was the third time a space shuttle has provided assistance to the commercial space company SpaceX, following STS-127 and STS-129. The DragonEye on STS-133 incorporated several design and software improvements from the version flown on STS-127 to provide increased performance. Its inclusion on STS-133 was part of a final test run ahead of being fully implemented on SpaceX's Dragon spacecraft, which had its maiden flight in December 2010. The navigation sensor provides a three-dimensional image based on the time of flight of a single laser pulse from the sensor to the target and back. It provides both range and bearing information from targets that can reflect the light back such as the pressurized mating adapter 2 (PMA-2) and those on the station's Japanese Kibo laboratory. The DragonEye DTO was mounted onto Discovery's existing trajectory control system carrier assembly on the orbiter's docking system. SpaceX took data in parallel with Discovery's Trajectory Control Sensor (TCS) system. Both the TCS and DragonEye "looked" at the retroreflectors that are on the station. After the mission, SpaceX compared the data DragonEye collected against the data collected by the TCS to evaluate DragonEye's performance. Flight day 2 saw the crew of Discovery begin their preparations to dock with the International Space Station (ISS). The day started with a firing of the Orbital Maneuvering System (OMS) engine, called the NC2 burn, to help Discovery catch up to the ISS. Commander Steven Lindsey, pilot Eric Boe and mission specialist Alvin Drew began the day performing an inspection of the Re-enforced Carbon-Carbon (RCC) panels with the Orbital Boom Sensor System (OBSS). Steven Lindsey and Eric Boe started the inspection on the starboard wing and nose cap, and continued on with the port wing; the whole survey took about six hours to complete. 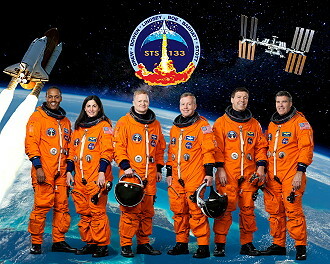 Discovery's launch for the STS-133 mission was precisely timed to lead to a link up with the International Space Station about 220 miles (354 km) above the earth. A series of engine firings during the first two days of the mission brought the shuttle to a point about 50,000 feet (15,240 meters) behind the station. Once there, Discovery started its final approach. About 2.5 hours before docking, the shuttle's jets were fired during what is called the terminal initiation burn. The shuttle covered the final distance to the station during the next orbit. As Discovery moved closer, its rendezvous radar system and trajectory control sensor provided the crew with range and closing-rate data. Several small correction burns placed the shuttle about 1,000 feet (304.8 meters) below the station. 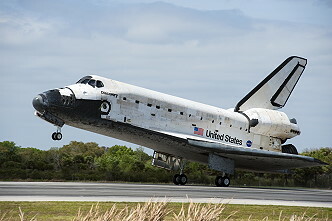 Commander Steven Lindsey, with help from Pilot Eric Boe and other crew members, manually flew the shuttle for the remainder of the approach and docking. Steven Lindsey stopped Discovery about 600 feet (182.9 meters) below the station. Timing the next steps to occur with proper lighting, he maneuvered the shuttle through an approximate eight-minute back flip called the Rendezvous Pitch Maneuver, also known as the R-bar Pitch Maneuver (RPM) since Discovery was in line with an imaginary vertical R-bar directly below the station. During this maneuver, station crew members Paolo Nespoli and Catherine Coleman photographed Discovery's upper and lower surfaces through windows of the Zvezda Service Module. Paolo Nespoli used a digital camera equipped with an 800 mm lens to provide up to one-inch (2.5 centimeters) resolution and Catherine Coleman documented the thermal protection system armed with a camera outfitted with a 400 mm lens providing three-inch (7.6 centimeters) resolution. The photography was one of several techniques used to inspect the shuttle's outer surface for possible damage. Areas of special interest included the thermal protection tiles, the reinforced carbon-carbon panels along the wing leading edges and the nosecap, landing gear doors and the elevon cove. The digital photos were downlinked through the station's Ku-band communications system for analysis by imagery experts in mission control. When Discovery completed its back flip, it was back where it started with its payload bay facing the station. Steven Lindsey then flew the shuttle through a quarter circle to a position about 400 feet (121.9 meters) directly in front of the station. From that point, he began the final approach to docking to the Pressurized Mating Adapter 2 at the forward end of the Harmony node. 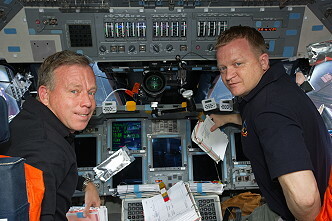 The shuttle crew members operated laptop computers that process the navigational data, the laser range systems and Discovery' docking mechanism. Using a video camera mounted in the center of the orbiter docking system, Steven Lindsey lined up the docking ports of the two spacecraft. He pause the shuttle 30 feet from the station to ensure the proper alignment of the docking mechanisms. He maintained the shuttle's speed relative to the station at about one-tenth of a foot per second (3 centimeters per second), while both Discovery and the station were moving at about 17,500 mph (28,163 km/h). Steven Lindsey kept the docking mechanisms aligned to a tolerance of three inches (7.6 centimeters). When Discovery made contact with the station on February 26, 2011, preliminary latches automatically linked the two spacecraft. The shuttle's steering jets were deactivated to reduce the forces acting at the docking interface. Shock absorber springs in the docking mechanism dampened any relative motion between the shuttle and station. 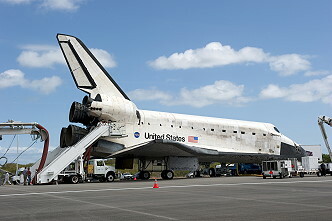 Once motion between the shuttle and the station had stopped, the docking ring was retracted to close a final set of latches between the two vehicles. The hard mate between the two vehicles was delayed by about 40 minutes because of relative motion between the station and shuttle, thus putting the crew behind the timeline for the day. 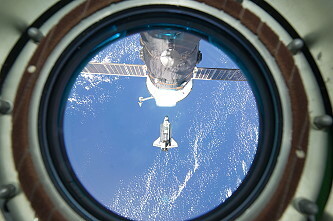 The hatches were finally opened at 21:16 UTC, and the Expedition 26 crew greeted the crew of STS-133. Later this day Michael Barratt and Nicole Stott used the stations robotic arm to pluck Express Logistic Carrier 4 from the shuttle cargo bay and hand it off to the shuttles arm, operated by Alvin Drew and Eric Boe. After moving the base of Canadarm2, the shuttle arm was to hand ELC-4 back for installation on the Earth-facing side of the stations starboard truss. There it will be used for stowage of spare parts, including a spare radiator launched aboard Discovery. 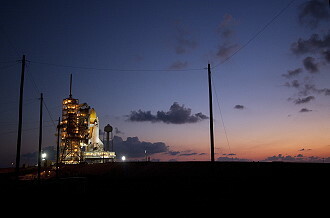 ELC-1 and 2 were placed on the station's truss structure during STS-129. ELC-1 is mounted on the lower inboard position on the port side of the station. ELC-2 is on the upper outboard side of the starboard truss, right next to where the Alpha Magnetic Spectrometer will be installed on STS-134. 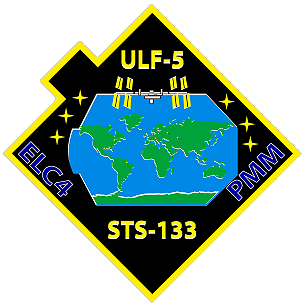 That mission also will deliver ELC-3, which will be the final logistics carrier installed on the station. It will be positioned on the upper outboard attachment point on the port side. 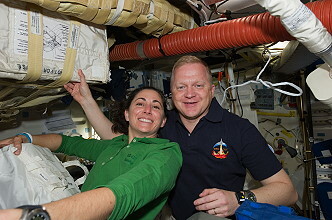 On flight day 4, Nicole Stott and Michael Barratt grappled the Orbiter Boom Sensor System (OBSS) using the Canadarm2 and removed it from the starboard sill of Discovery's payload bay. Once it was grappled and out of the payload bay, the Shuttle Remote Manipulator System (SRMS) grappled the end of the OBSS and took a hand off from the Canadarm2. The OBSS was grappled by the space station arm, because the SRMS could not reach it due to clearance issues, and it needed to be moved out of the way so that the Permanent Multipurpose Module (PMM) could be removed from the payload bay. After the OBSS hand off, the entire STS-133 crew was joined by ISS Expedition 26 commander Scott Kelly and Flight Engineer Paolo Nespoli for a series of in-flight media interviews. The crew also completed more cargo transfers to and from the ISS. Throughout the day, Alvin Drew and Stephen Bowen prepared tools that they would use on their spacewalk on flight day 5. Later in the day, they were joined by the shuttle crew and ISS commander Scott Kelly and Flight Engineer Paolo Nespoli, for a review of the spacewalk procedures. After the review, Stephen Bowen and Alvin Drew donned oxygen masks and entered the crew lock of the Quest airlock for the standard pre-spacewalk campout. The airlock was lowered to 10.2 psi for the night. This was done to help the spacewalkers purge nitrogen from their blood and help prevent decompression sickness, also known as the bends. The first EVA by Stephen Bowen and Alvin Drew occurred on February 28, 2011 (6h 34m). They installed a power extension cable between the Unity and Tranquility nodes to provide a contingency power source should it be required. 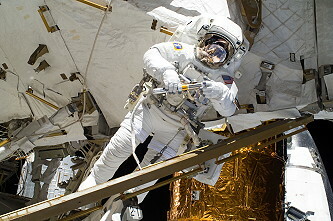 The spacewalkers moved the failed ammonia pump module that was replaced in August 2010 from an attachment bracket to a stowage platform adjacent to the Quest airlock. Alvin Drew and Stephen Bowen installed a piece of hardware that will go under a camera on the truss. The hardware will tilt the camera to provide clearance for a spare part to be installed on a future mission. They next replaced a guide for the rail cart system used for moving cargo along the truss. The guides were removed when the astronauts were performing work on the station's starboard Solar Alpha Rotary Joint, which rotates the solar arrays to track the sun. Of course, one of the primary goals of STS-133 was to deliver the new Permanent Multipurpose Module (PMM), to the space station. But before it could be attached to the Unity node, an extension cable must be installed on the J612 cable. The cable, which powers secondary airlock heaters, was inaccessible after the PMM is installed in its current state. The extension cable will make any future replacements of the system that might be necessary easier. Installing the extension cable took Stephen Bowen and Alvin Drew about 30 minutes. To do so, Stephen Bowen removed dust caps from the cable and released some wire ties currently holding the J612 cable in place. Then, he disconnected the original cable from the Unity node and connected the extension cable in its place, before tying down the extension cable. Alvin Drew, meanwhile, connected the extension cable to the original cable, which runs to the Quest airlock. He also worked to secure the cables in place. From there, Stephen Bowen moved to the external stowage platform 2, where a foot restraint was waiting for him to attach it to the space station's robotic arm. On it, Stephen Bowen moved to the payload orbital replacement unit accommodation (POA), which is basically one of the robotic arm "hands" without the arm, used to temporarily store equipment. In this case, the equipment was the pump module that failed over the summer 2010. To remove the pump module from the POA, Stephen Bowen installed a handle on the module and then had the robotics officers release the POA's hold on it. He carried the module back to the external stowage platform, which was its long-term storage location. While Stephen Bowen retrieved the module, Alvin Drew retrieved from the port truss' crew equipment and translation aid, (CETA), cart a tool that was used to remove remaining ammonia from the pump module. Stephen Bowen and Alvin Drew worked together to secure the pump module. Four bolts were installed to hold it in place. They also installed the tool Alvin Drew retrieved - called the vent tool - for use on the second spacewalk. Once that task was over, Stephen Bowen climbed off of the robotic arm. While he did so, Alvin Drew moved to a piece of the station's truss near the center of the system - the Z1 segment - where he folded back two flaps of insulation on a remote power control module, relocated a tool stanchion and retrieved another foot restraint, this one to store inside the airlock. Afterward, Stephen Bowen and Alvin Drew came back together to install a camera wedge on a video camera on the first starboard segment of the station's truss. The wedge gave the camera added clearance that it will need once the ExPRESS Logistics Carrier 4 that Discovery delivered is installed nearby. To install the wedge, Alvin Drew removed the camera's stanchion by removing one bolt. The wedge was secured to the truss using a bolt, and then the stanchion bolted back onto the wedge. The spacewalkers then moved together further down the starboard truss to the solar alpha rotary joint at the starboard three segment. There, they were installing two extensions to the station's mobile transporter track, which will allow the mobile transporter to travel the entire length of the track with the CETA cart and still reach all the worksites. Each extension (one on either rail of the track) was secured by two bolts. Alvin Drew and Stephen Bowen wrapped up their work at S3 by pushing two "stops" out of the way on the rails - one meant to keep the mobile transporter from passing and one meant to keep a spacewalker's tether from passing. The last task for the first spacewalk of the mission was for Stephen Bowen and Alvin Drew to participate in the Japan Aerospace Exploration Agency activity called Message in a Bottle. They opened and filled a metal cylinder that was signed by other astronauts who have flown in space. The bottle then was returned to the ground for public display. On March 01, 2011 Michael Barratt and Nicole Stott inched the 58-foot-long (15 meters) space station robotic arm onto a grapple fixture on the Permanent Multipurpose Module (PMM). The arm lifted the fully-loaded 28,353 pound (12,861 kg) PMM from space shuttle Discovery's cargo bay and carry it to the Earth-facing port on the Unity node, where it will be permanently attached. 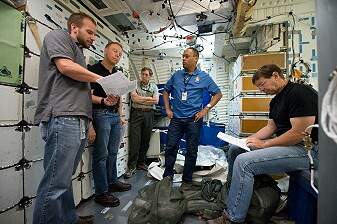 The second and final EVA was performed by Stephen Bowen and Alvin Drew on March 02, 2011 (6h 14m). The astronauts removed thermal insulation from a platform, while Stephen Bowen swapped out an attachment bracket on the Columbus module. Stephen Bowen then installed a camera assembly on the Dextre robot then removed insulation from Dextre's electronics platform. Alvin Drew installed a light on a cargo cart and repaired some dislodged thermal insulation from a valve on the truss then remove other insulation from Tranquility. The final task was to "fill" a special bottle with space for a Japanese education payload. The bottle will be part of a museum exhibit for public viewing. The second spacewalk of the mission included one more task to finish up the work with the failed pump module. That task - removing the remaining ammonia from the pump module - took Alvin Drew about an hour. 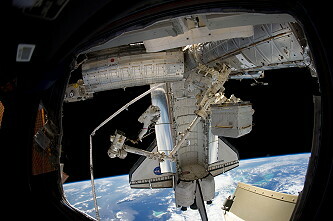 The balance of the two spacewalker's six and a half hours scheduled outside the station was spent on the assorted tasks originally assigned to the STS-133 mission. The pump module work was first up on Alvin Drew's timeline. As the vent tool was been installed on the first spacewalk, Alvin Drew simply had to open the vent and wait about two minutes for ammonia to be vented out to space. (The tool allows it to vent without contaminating Alvin Drew's spacesuit with ammonia.) Once it was done, he removed the tool and took it back to the Quest airlock. Meanwhile, Stephen Bowen was climbing back into the foot restraint on the station's robotic arm. He rode the robotic arm to the end of that module to pick up a lightweight adapter plate assembly, which was used to attach experiments to the exterior of Columbus. Stephen Bowen stored it on the sidewall carrier in the shuttle's cargo bay to return home with Discovery. 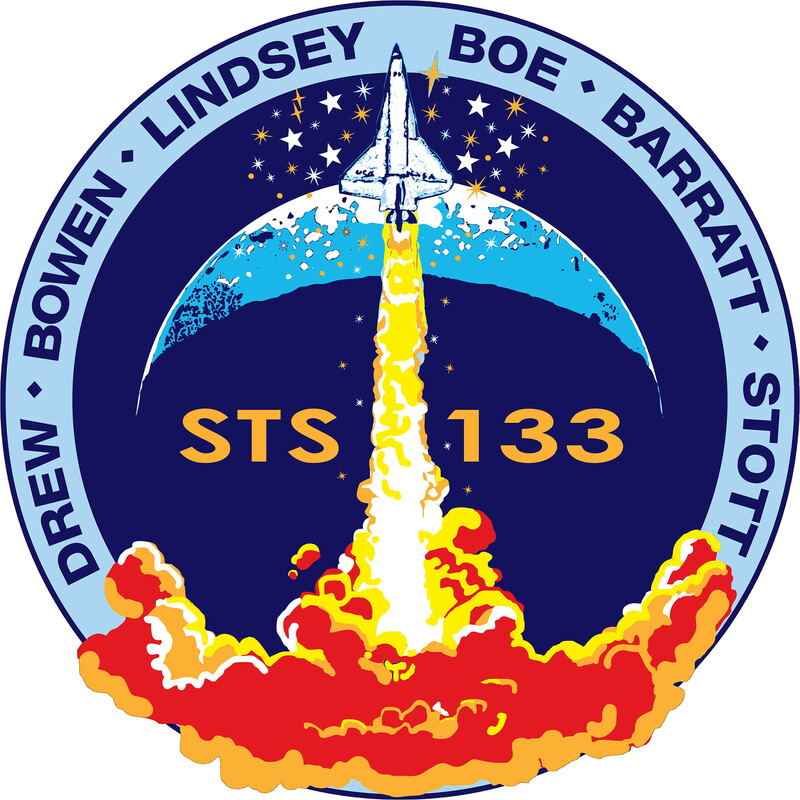 This task was originally scheduled for STS-131, but canceled due to time constraints. Stephen Bowen needed to remove one bolt to retrieve the plate and install one bolt to secure it in the cargo bay. Alvin Drew removed some insulation from the avionics assembly on the new ExPRESS Logistics Carrier 4 and retrieved three sets of stowage bags from the CETA cart on the port side of the station's truss system. The spacewalkers continued to work separately throughout the rest of the spacewalk. The robotic arm flew Stephen Bowen to the special purpose dexterous manipulator, or Dextre. There, he installed a second camera (using one bolt) on the robot and removed an unnecessary insulation blanket, while Alvin Drew installed a light on the port CETA cart. To install the light, Alvin Drew disconnected a cable on a stanchion on the CETA cart and connected it to the new light, then drove one bolt to hold it in place. From there, Alvin Drew travelled to a radiator beam on the first port segment of the truss and installed insulation on its valve module fluid line. He also spent some time troubleshooting a radiator grapple fixture stowage beam. The beam, which was originally installed on STS-131, was used temporarily to store handles that would be necessary if a radiator ever needed to be replaced. However, during its installation, the astronauts noticed the beam was looser than they expected. Experts on the ground think this might be because the two bolts securing it did not seat properly or were misaligned. So, to fix that, Alvin Drew was releasing the two bolts and redriving them. Afterward, Alvin Drew moved to the Tranquility node to remove some insulation covering electrical connectors. In the meantime, Stephen Bowen had gotten off the robotic arm. Since he was in the vicinity, his next task was to install a lens cover on the camera on the arm's elbow joint. The cover will protect the lens from any erosion that might be caused by the thruster plume of visiting vehicles that the arm is used to dock. It is attached using a lever that locks it into place. The rest of the spacewalk was spent installing similar covers on other cameras. Stephen Bowen installed one of Dextre's cameras (the one he did not install earlier in the spacewalk). And Alvin Drew's last tasks were to install a lens cover on the POA's camera. Meanwhile the mission was extended two days. At undocking time, the hooks and latches were opened and springs pushed the shuttle away from the station. Discovery's steering jets were shut off to avoid any inadvertent firings during the initial separation. Once the shuttle was about two feet (61 centimeters) from the station and the docking devices were clear of one another, Eric Boe turned the steering jets back on and manually control Discovery within a tight corridor as the shuttle separated from the station. Discovery moved to a distance of about 450 feet (137.2 meters), where Eric Boe began to fly around the station. Discovery circled the shuttle around the station at a distance of 600-700 feet (182-213 meters). Once the shuttle completed 1.5 revolutions of the complex, Eric Boe fired Discovery's jets to leave the area. The shuttle began to increase its distance behind the station with each trip around the earth while the crew conducted one last inspection of the heat shield using the Orbiter Boom Sensor System (OBSS). The distance was close enough to allow the shuttle to return to the station in the unlikely event that the heat shield is damaged, preventing the shuttle's safe re-entry.